November saw stronger than anticipated month-on-month declines for both roles on offer and job seekers, wiping away the strong October numbers. New jobs decreased by 32% month-on-month to 6,405 and by 13% year-on-year. 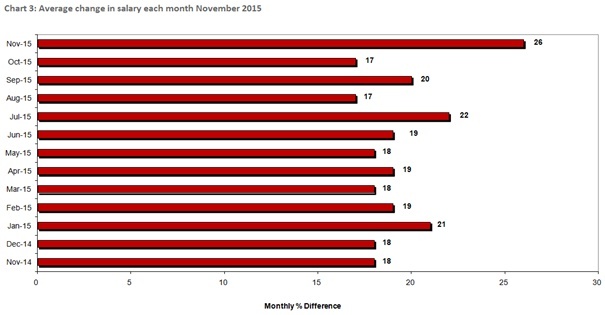 Those seeking new roles decreased by 27% month-on-month to 10,492. The only increase was for job seekers year-on-year, growing by 26%. “The numbers were somewhat disappointing,” says Hakan Enver, Operations Director, Morgan McKinley Financial Services. The data only takes into account jobs in London. In recent years, companies have been setting up middle and back-office units outside of the capital with cities like Birmingham, Edinburgh and even Liverpool showing strong growth in financial services. “Employers are going rural which makes sense from a cost and a recruitment point of view. Many employees are being priced out of London and the cost of living and quality of life, particularly for those with children, can be highly attractive outside the square mile,” says Enver. Research by the Cebr and L’Oreal showed employees who have gained international professional experience could add as much as 15% to their salaries, over a one to three year period after their return. The study found that employees in organisations that offer international career opportunities are likely to remain in the company for four years longer than companies with no international opportunities, showing an increased demand from employees for international career opportunities. This suggest that demand for returning expatriates will only grow as the planned cuts to skilled migration and visa restrictions will constrain the market of international job seekers to the UK. Financial services firms in the UK have expressed concerns of the negative effects of curbs on working visas to non-European Union nationals. A survey by the Chartered Institute for Securities & Investment found that nearly three quarters of financial services professional believed that plans to reduce non-EU workers would harm the British economy. Recognising the serious ramifications for the financial industry, the Treasury has stepped in to lend its support by indicating that it would assist in taking care of the dispute around foreign worker visas. “We have been reporting throughout the year about the improving salaries within the City. Our data has for some time suggested that a move from one organisation to another, can demand a strong increase on the fixed base“ says Enver. Further confirmation of this positive trend was published last month by the ONS which reported that weekly earnings across the UK have grown by 1.9% compared to the same time last year, now averaging £528. 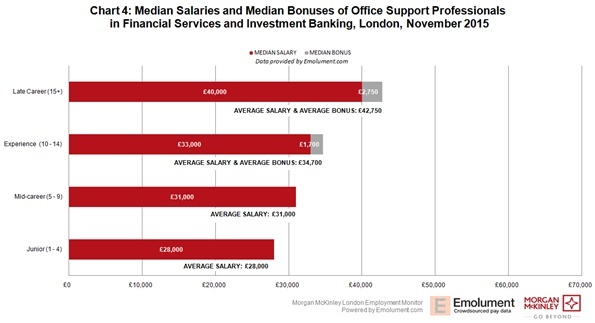 Unsurprisingly, London remained the top area for wages, with employees earning an average of £660 a week, beating the national average by 25%. The data included positive news regarding gender equality, with the pay gap between men and women shrinking to 9.4%, the best result since the survey began in 1997. Despite this, the biggest gender pay gap is in the City of London, with women earning an average of £21,000 (40%) a year less than men. “Despite decreasing numbers month-on-month in both job seekers and opportunities, the 12-month trend still suggests a positive increase in both. Combined with positive data on UK wage growth and a more than healthy average 26% salary increase for those securing new positions last month, irrespective of the expected dip in numbers, it is possible that the November drop came earlier than the normal December decrease. Therefore, the numbers shouldn’t be taken as the beginning of a downward trend, at least not before seeing how the new year begins,” concludes Enver. 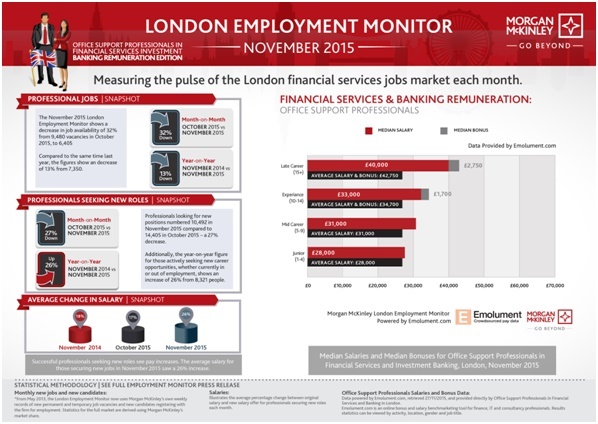 Last month, the Office Support space within Financial Services saw an increase in demand for Team Assistants. This resulted in a drop in need for one-to-one PAs. Due to the time of the year, companies were keen to interview and progress candidates to quickly to the second stage in the hope of having a successful appointment in place before Christmas. As a result of the increase in roles, recruitment consultants recognised the importance of interpersonal relationships and building rapport with professionals. Those with strong experience will often receive a number of job offers and it is not rare to see businesses counter-offering to retain the best talent.